The Colts were back in Anderson on Tuesday to wrap up their final week at Anderson University. Even though the players were not in full pads on Tuesday afternoon, you couldn’t tell by the physical nature of the 90-minute practice. Ahmad Bradshaw off PUP, but still rehabbing: Like he has done for the majority of the past two weeks of practice, Ahmad Bradshaw was busy rehabbing during the Colts afternoon practice. Bradshaw said following Tuesday morning’s walk-through that he would like to get some playing time during the Colts third preseason game. Chuck Pagano said the Colts offense is looking for more balance and pointed to an “angry, downhill” running style of Bradshaw to help that cause. The NFL is a multiple-back league and having a multi 1,000-yard rusher in Bradshaw would aid Pep Hamilton’s rushing attack. Will another wide receiver emerge? Reggie Wayne, Darrius Heyward-Bey and T.Y. Hilton (in whatever order you want) are the Colts top three wideouts. It appears as if Griff Whalen is the No. 4 man but he is day-to-day after suffering a groin injury against the Bills. LaVon Brazill would seem to be the guy but he will miss the first month of the season. How about Nathan Palmer? Or Jabin Sambrano? A fifth wide receiver (not Brazill) will in all likelihood dress for the first four games of the season so these next three preseason games should go a long way in deciding that spot. What’s in store for Daniel Adongo and Josh McNary? : Some of the more interesting sights on Tuesday was seeing Adongo in pads and going through positional drills. It appears Adongo’s biceps injury has pushed his growth back a bit so a practice squad position is probably the best case scenario for the rugby star. Josh McNary is still recovering from a hamstring injury but when he’s been on the field he has produced. The West Point product was signaled out by Colts defensive coordinator Greg Manusky for his play early in training camp, even though McNary is making the transition to a new position at inside linebacker (granted he hasn’t played any football since 2010). McNary was in the thick of the ILB position battle so getting him back on the practice field will be an interesting topic to watch moving forward. With Week One in the books in Anderson, here are four defensive items to look towards in Week Two. Josh Chapman’s development-The “900 pound safe” has been very impressive working with the second unit in Week One. The nose tackle position will undoubtedly need more than one body in 2013 so expect Chapman to play big minutes along with starter Aubrayo Franklin. It can’t be stated enough how much Chapman truly embraces the role of a 3-4 nose tackle and his presence will go a long way to stopping the run this year. Bjoern Werner’s role-Werner’s high motor was evident last week and you can see why the Colts valued the German native during April’s NFL Draft. If he was at any other position, Werner probably would be starting but with Robert Mathis and Erik Walden ahead of him, it looks like the rookie’s role will be primarily on special teams and passing downs this year. Fans should get frequent looks at Werner coming off the edge this season with the outside linebacker depth allowing the Colts to bring the first round pick along at his own pace. Can the secondary continue its hot start?-The ball-hawking nature of the Colts secondary has been prevalent in 2013. The takeaways number of 15 last year is a point of emphasis this season and if Week One is any indication than the Colts defensive backs will be getting their hands on numerous balls. Vontae Davis and Darius Butler have been particular strong with Greg Toler hoping to rejoin the secondary this week after suffering a concussion on Wednesday. Return of Antoine Bethea-The Colts Pro Bowl safety has not been in Anderson since Tuesday as he was back home for the birth of his daughter. Coach Pagano said he expects Bethea back very soon and fans are eager to see No. 41 pair with LaRon Landry at the backend of the defense. Bethea has been in the Colts starting lineup every game since the 2007 season and getting him back on the practice field will be a welcoming sight for defensive coordinator Greg Manusky. His importance wasn’t that of an Andrew Luck, Reggie Wayne or Jerrell Freeman but one should not forget the impact of Darius Butler last season. Butler had two interceptions returned for touchdowns last year, both coming in road victories. During the Colts 2013 training camp, Butler has continued to make plays with several interceptions during the first week of work. In 2012, the Colts defense forced just 15 turnovers and Butler said that is something they are harping on in camp. The secondary has been particularly active early on getting their hands on numerous balls. Butler joined the Colts during the bye week last season and was a critical pickup during the Colts 11-5 year. Colts defensive coordinator Greg Manusky said Butler has continued to play off his success last season and is currently the team’s nickel cornerback. It appears the Colts have found some quality depth at the cornerback position which is a welcoming sight with not one corner on this year’s roster having been on the team prior to OTAs in 2012. Butler knows the Colts have the potential for a championship level defense and he’s doing his part to get to the pinnacle. When Chuck Pagano talks about the keys to stopping an opponent’s rushing attack those three words are quickly mentioned. The ability to hold the point of attack and send traffic back inside is the goal of whoever is setting that edge. Erik Walden considers this a strength of his. “It’s just about heart,” Walden said on Wednesday. Walden’s ability to set the edge is one of the major reasons the Colts coveted the 250-pound outside linebacker during free agency. “When we saw (Walden) coming out of Green Bay and when we picked him up as a free agent, he was a great player in the sense of setting the edge,” Colts defensive coordinator Greg Manusky said. In his last two seasons with the Packers, Walden played in 31 games and compiled 106 tackles and six sacks. 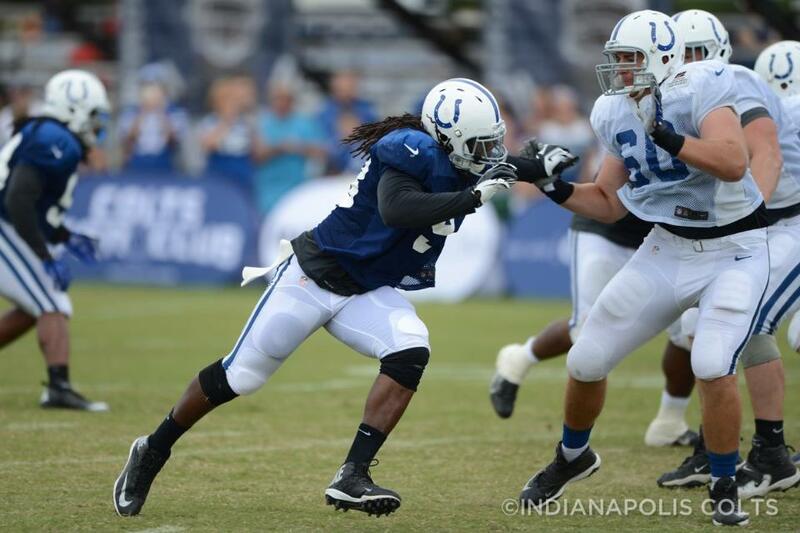 He is expected to line up opposite Robert Mathis this season and is a key cog at one of the Colts deepest positions. When the pads were strapped on for the first time on Tuesday afternoon, Walden reminded Dwayne Allen who he was going up against. This season Walden will don No. 93, a number that was worn on the back of Dwight Freeney’s shoulders for over a decade. Walden and Freeney both have a Super Bowl ring on their resume but the Colts new No. 93 was quick to point out that this is a new chapter in his life, one he hopes finishes with a storybook ending.